Cross posted from CAMERA’s Snapshots blog. Nov. 17 update: The New York Times is refusing to publish its Editors’ Note and corrective language in the print edition, where the article also appeared. Reem’s is one of a handful of Arab bakeries in the Bay Area — but it is likely the only one where you’ll find the children’s book “A Is for Activist” on the shelves and an enormous mural of the controversial Palestinian activist Rasmeah Odeh on the wall. was deported from the United States for concealing a decades-old bombing conviction arrived in Jordan on Wednesday. . . .
Odeh didn’t disclose her criminal record when applying for a U.S. visa and later for U.S. citizenship. The depiction of a convicted bomber responsible for the killing of two civilians who was deported from the U.S. after she concealed her criminal records from authorities as a “controversial Palestinian activist” is a complete whitewash of her crime. 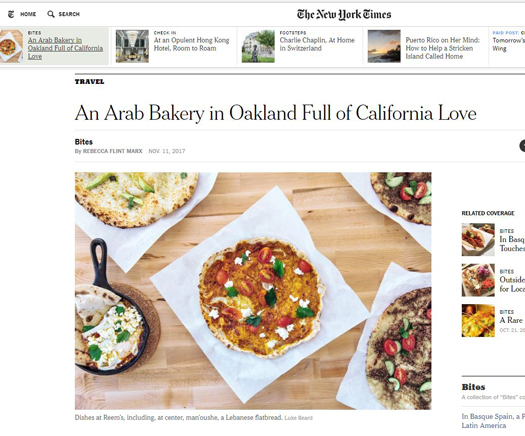 While Ms. Assil’s food has drawn plenty of praise, the bakery’s mural has invited criticism: in late June, an online op-ed charged that Mrs. Odeh’s portrayal glorified terrorism, and the bakery’s Yelp page was besieged by a slew of one-star reviews. “It was really scary,” Ms. Assil said of the experience, but added that it won her new allies. By concealing Odeh’s crimes and her victims, readers would have no way of knowing the reason why some might accuse restaurant owner Reem Assil of glorifying terrorism. Uninformed readers might conclude that Assil’s accusers were motivated by nothing more than bigotry at worst or differing politics at best. Ignoring the real victims in this story – Kanner and Joffe – Flint Marx casts the purportedly social minded, loving Assil as the victim who was really scared. In September National Geographic removed a similarly misleading mischaracterization, identifying notorious hijacker Leila Khaled as a “Palestinian activist.” Khaled, like Odeh, was affiliated with the Popular Front for the Liberation of Palestine – a group designated as a terror organization by the European Union and the United States, as well as Israel and Canada. 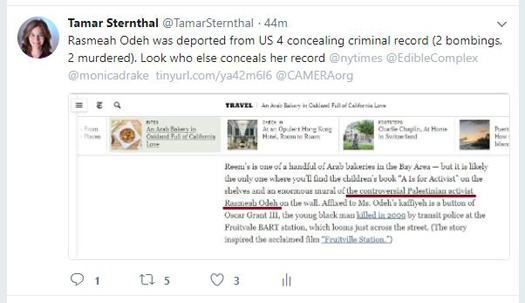 CAMERA has contacted The Times to ask for a clarification noting that Odeh was convicted in Israel of two bombings, including one that took the life of two university students, and that she was deported from the United States for concealing her criminal record.